Pumpkin candle holders are extremely versatile, as you can use them throughout the fall. They fit nicely into both Thanksgiving and Halloween décor. You can purchase candle holders with a pumpkin shape or pattern, or have some fun making your own. Pumpkins lend themselves well to homemade candle holders. They come in all different sizes, so you can use them in almost any space. There are several ways to turn pumpkins into candle holders, which you can customize to suit your tastes. These pumpkin candle holders look really pretty when you make a bunch of them and group them together, or scatter them around a holiday display table. Cover the surface you'll be working on with newspaper. Using a sharp knife, cut the tops off the pumpkins. You can make a straight cut and take the whole stem end off, or a traditional jack o' lantern cut which acts as a lid. Using a metal spoon, scrape out all of the seeds and pulp. 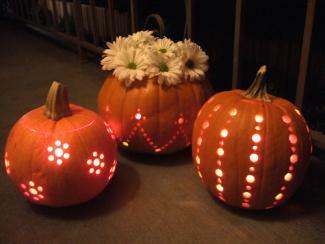 Carve shapes or holes into the pumpkins with the small knife, or use the drill to punch holes. Using a drill is much easier and safer, and you can create patterns with the small holes. Wipe the surface of the pumpkins with a clean cloth. Add your tea lights and light them. If you plan to put the pumpkin "lids" back on top, make sure you cut several wedges out of the lids first to prevent burning them, or cutting off the air supply to the candle.These candles can't be used for very long as the pumpkins are perishable, but you can extend their lives by a day or two by rubbing the inside and all cut surfaces with lemon juice and allowing it to dry. Carve a small but fairly deep hole in the tops of mini pumpkins, just wide enough to insert a taper candle. Paint the pumpkins or leave them plain. Insert tapers, making sure they fit snugly. You can also cut larger holes to insert tea lights instead. Use large pumpkins and carve them as you would for Halloween. You don't need to carve faces into the pumpkins - use any pattern or picture you'd like. Place a pillar candle or flameless candle inside to light them up. These make great floor candle holders. This fun project uses wine glasses and paint to make candle holders that look like pumpkins. Unlike real pumpkins, these can be used year after year. If you'd rather purchase some candle holders with a pumpkin motif, here are some interesting variations to try. Fall pumpkin pillar holder - This candle holder features small pumpkins and other fall foliage. It's perfect for Thanksgiving or throughout the season. Copper pumpkin tea light holders - These copper candle holders would fit in with all of your fall decorating. Distorted pumpkins - Who says that pumpkins always have to be shaped like pumpkins? These tall ceramic candle holders are distorted and stretched, but still resemble the familiar orange gourd. Pumpkins and other fall candle holders can be used just about anywhere. You can hang them outdoors with a bit of strong string or chain, like lanterns, or scatter them throughout your home for a seasonal touch. Add candles in comforting fall scents like apple cinnamon or pumpkin pie to enhance the effect.